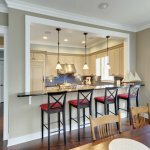 How do you widen a congested looking kitchen? Why do you want to do that? It makes a kitchen less cluttered. How do you do it? What you do is flush out the island, put the dish washer right by the sink, and take out the cabinets above the island. You may get rid of the claustrophobic feel by knocking out some walls and open it up. 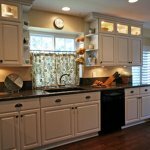 We can widen the pass-through by replacing the cabinets with pendant or recessed lights. What about storage space? If we flush out the island, we take away the cabinets, too. From the design perspective, there is really no need for cabinets above the sink. We can introduce a pantry to complement the missing space. Do you have a house where the cost of rehabbing is just too prohibitive? Have you thought about selling the house as-is so you don’t have to worry about the headaches (e.g., managing the contractors, designing the kitchen, sourcing the materials, shopping for a well qualified team, etc.)? Give us a call below. Let us help you by buying your unwanted house!